This is the fifth post in my series on the theoretical bases for arguments against – and in the next section for – government funding for the arts. In this installment I look at neoliberalism, that branch of market-loving political theory popularized by the Reagan White House, and extended by Al Gore’s national performance review under Clinton. Look. You can either increase demand or decrease supply. Demand is not going to increase, so it is time to think about decreasing supply. 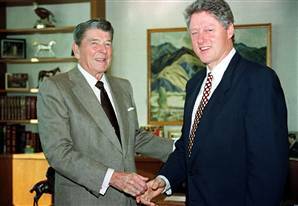 Neoliberalism is in the first instance a theory of political economic practices that proposes that human well-being can best be advanced by liberating individual entrepreneurial freedoms and skills within an institutional framework characterized by strong private property rights, free markets, and free trade. The role of the state is to create and preserve an institutional framework appropriate to such practices… It must set up those military, defence, police, and legal structures and functions required to secure private property rights and to guarantee, by force if need be, the proper functioning of markets… Furthermore, if markets do not exist…then they must be created, by state action if necessary. (p. 2). As Brown (2003) notes, the theoretical grounding of neoliberalism is found largely in the work of Austrian philosopher and economist Friederich von Hayek and University of Chicago economist Milton Friedman (Harvey, 2005) and their followers. Hayek believed that competition supports liberty and is supported by legal institutions that can withstand the test of time. In describing the relationship between competition and liberty, he wrote, “the functioning of competition not only requires adequate organization of certain institutions like money, markets and channels of information-some of which can never be adequately provided by private enterprise – but it depends, above all, on the existence of an appropriate legal system, a legal system designed both to preserve competition and to make it operate as beneficially as possible” (1944, in Arnold, 1980, p. 349). In order for the legal institutions or “general rules” to emerge, Arnold (1980) explains that it is necessary to have a moral code such that “holders of this moral code must accept as sacrosanct the dictates of the “marketplace,” whether these dictates are in one particular instance favorable or unfavorable to them” (p. 350). Hayek favored “non-intrusive, non-directive organizations which provide a stable and predictable framework for the coordination of individuals’ activities” (Held, 1996, p. 258) as the means to satisfy the greatest number of people. Friedman, in complementary fashion, views economic freedom as expressed in the capital market to be a check on political power (Friedman, 1962). Both view private property, competition, and distance between politics and market economics as prerequisites for freedom and liberty. Friedman extends the concept of market to be not only as voluntary exchange of goods, but as voluntary actions of all kinds (Mishan, 1975) such that, for example, voluntary attendance at a free school concert would be considered a market activity. The neoliberal faith in markets has pervaded both economic and political thought since the late 1970s, leading to widespread governmental and institutional reform around the globe (Kettl, 2005). While neoliberal philosophy may lead to greater intervention in maintaining the health of markets, it relies on liberalism’s inclination toward limited government in the development of institutions to sustain economic health. Gwartney, Holcombe, and Lawson (1998) make a typically neoliberal argument for limiting the government intervention: “Increases in the size of government have slowed economic growth. More rapid growth is possible, but the higher potential growth can only be achieved if we are willing to reduce the relative size of government” (p. 185). Their Cato Institute-funded paper, although peppered with charts and graphs of OECD growth rates, makes unsubstantiated claims for the supremacy of the market, however. They write, to cite just one example, “We also include education, even though it does not exhibit the characteristics of a public good and the private sector has shown itself quite capable of providing high-quality education” (p. 166). In a neoliberal state, even government itself is considered of secondary importance in relation to the market. Braun (2010) goes so far as to contend that “neoliberalism, unlike Smith’s free-market model, conceives of the political as antithetical, not subordinate, to the economic. In this imaginary, the values of democracy – equality, freedom, and justice – must not be negotiated in the public sphere; …any attempts to do so will interfere with the circulation of capital” (p. 140). The neoliberal ideal is a “triumph of markets over governments” (Stuckey & Ritter, 2007, p. 652). Influential Public Choice economist Tyler Cowen applies economic principles to his critiques of art and of arts and culture policy. In contrast to the neoconservative view that holds that the state could potentially support “masterpieces” or art deemed to be “good,” the public choice view takes a “value neutral approach to cultural evaluation” (Cowen, 1998, p. 7). Cowen argues that “well-developed markets support cultural diversity” (p. 22). In the market-driven cultural economy he favors, “The state does best in promoting the arts when it acts as simply another customer, patron, or employer, rather than as a bureaucracy with a public mandate” (p. 37). In other words, in Cowen’s view, the government should not be a patron, but a customer buying art in the free market (McGuigan, 2005). He pays particular attention to the detrimental effect that neoliberal housing policies have had on equity, concentrating the poorest of the poor in the worst possible housing projects. Bourdieu asserts that the ideological shift toward neoliberalism in the 1970s, made manifest in the 1980s “was accompanied by a destruction of the idea of public service” (1999, p. 182). Banks points to another concern raised by neoliberalism’s critics: their “widespread belief is that rampant individualization, a culture of self interest, and the primacy of market rationality have rendered the economy more unethical and immoral” (Banks, 2006, p. 456). Thus, not only are governmental agents and others acting outside the public interest, but by obeying neoliberalism’s market-based rationality, they may be acting unethically or even immorally. Thus, although neoconservatives may have argued that government intervention in the arts could lead to immorality, obeisance to market forces could potentially do the same. Despite these critiques, the arts policy sector has responded by acquiescing to or appropriating, depending on one’s perspective, the language of the marketplace. The next installment (the last) looks at two implementations of that language: the creative industries and the public values constructs. Stay tuned! This entry was posted in Arts funding, Arts policy, Culture and democracy, Uncategorized and tagged #supplydemand, art market, Arts funding, arts policy, cultural economics, Culture and democracy, inequality, NEA, neoliberalism. Bookmark the permalink.